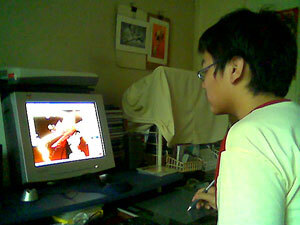 Pixel Pintura Workshops on its 6th Year! The Pixel Pintura is now on its 6th year! Click the poster for a larger version. 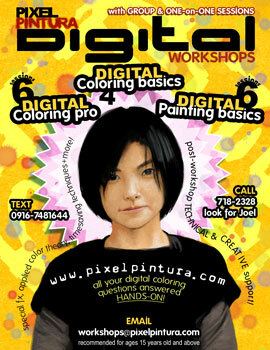 Digital Coloring Basics is 4 sessions @ 3 hours a session. Digital Coloring Pro is 6 sessions @ 3 hours a session. 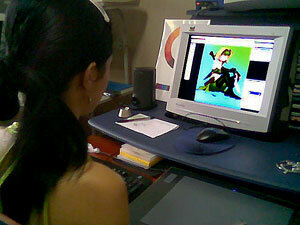 Digital Painting Basics is 6 sessions @ 3 hours a session. Any of the workshops can be taken solo or with a friend. Maximum of 2 students. We are located at 854 A. Mabini St. Mandaluyong City. Philippines of course. 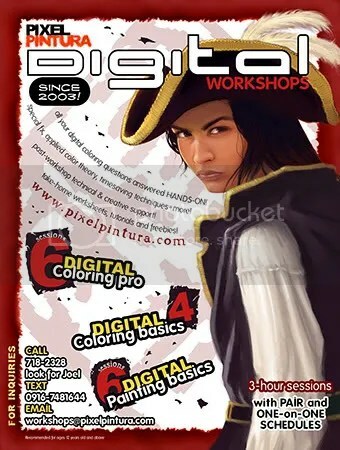 Pixel Pintura 2007 Poster – Arrr!! Aye mateys, summer vacation be almost here! And what be coming along with it pray tell? 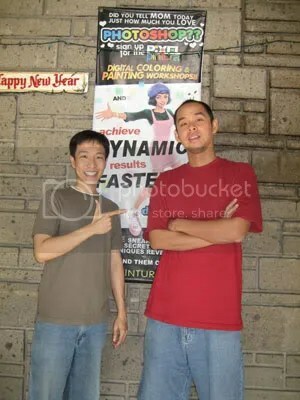 Why the 2007 Pixel Pintura Poster of course! 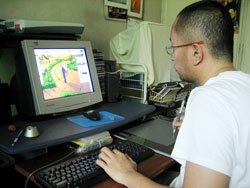 Sign up for the Digital Coloring or Digital Painting classes held here in Mandaluyong City! Please send me an email for more details on the schedules, curriculum, fees, and what you can expect to take home when you attend this one-of-a-kind workshop where I teach not just the tools but principles & theory behind light & color. 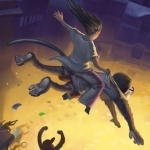 Recommend for ages 12 & up, with a strong stomach for art & technical concepts in the crow’s nest. Not for the faint of heART! Arrr!! ARRRR!!! With summer nearing an end. I’d like to congratulate my students who have finished their Pixel Pintura workshop. Michael Angelo Manuel , Cristina Satairapan, Kevin Ang, Lance Lee, Benedict Coo, Victor Ilagan, and the de Guzman girls: Sam and Alex! Practice what you’ve learned. Stay in touch for any questions you might have. The Pixel Pintura workshops don’t end after the summer! They are still ongoing! 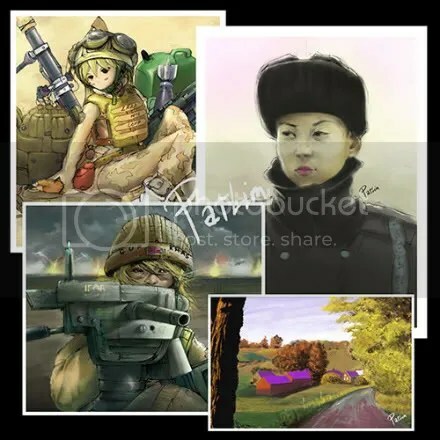 Visit the website at www.pixelpintura.com. Charmaine Baylon, Deputy Managing Editor of the Good Housekeeping Magazine here in the Philippines is doing an article on Pixel Pintura. It’s expected to be in the July 2006 issue. I’ll be sure to make more happy children’s book art because of this experience as I found I had very little to show all the moms on Good Housekeeping! This April has begun with more work and workshops than I can handle. Now how did I get to this point? The Pixel Pintura workshops this summer have been amazing with a record number of students attending anything from Digital Color Basics to Pro, to Digital Painting Basics. 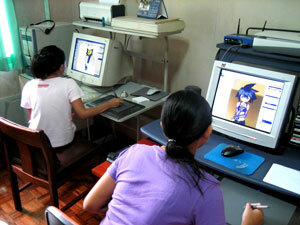 The introduction of the more affordable Digital Coloring Basics workshop did a lot to increase the volume of students. And I suppose www.pixelpintura.com had a lot to do with it as well. I also took my workshop and posted it on events websites. I think www.clickthecity.com brought a number of inquiries since apparently, it was easier to find on Google. And of course God answers prayers. Beyond the workshops there’s still client work to do. With 120 pages of graphic novel toning and lettering due at the end of April, things have become extremely tight — requiring me to enlist the aid of Michael Kanoy, a Visual Communications junior at the College of Fine Arts, UP. (Oh yes, you CFA interns… I pay my interns!! Look out for me next summer!) Hopefully he can match 4 flat pages a day to match my speed at toning them as well as pick up lettering responsibilities. In the meantime, there’s also Robotika 4and CAST9 to follow in May. Robotika only has around 8 pages to go and I’m weeks ahead. CAST? Well… I’ve been so busy I haven’t even picked up the rest of my pay!!! It’s March! From March 1 to 20, all days (except Sundays) will be open for anyone wishing to take up any Pixel Pintura workshop, one-on-one. Group sessions are held on weekdays beginning March 20 and this will move the one-on-one sessions to Saturdays. In the meantime, even greater responsibilities on the horizon for me. 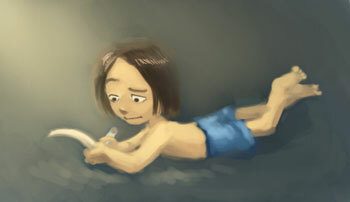 I may be working on a 120-page graphic novel sometime March-April. Scanning, grayscales, & lettering. So I may be calling for assistance on any of the 3. Keep your eyes peeled at the Rusty Banana Forge! !